Hearing is a complex process, hearing loss in New York, NY is a delicate treatment. 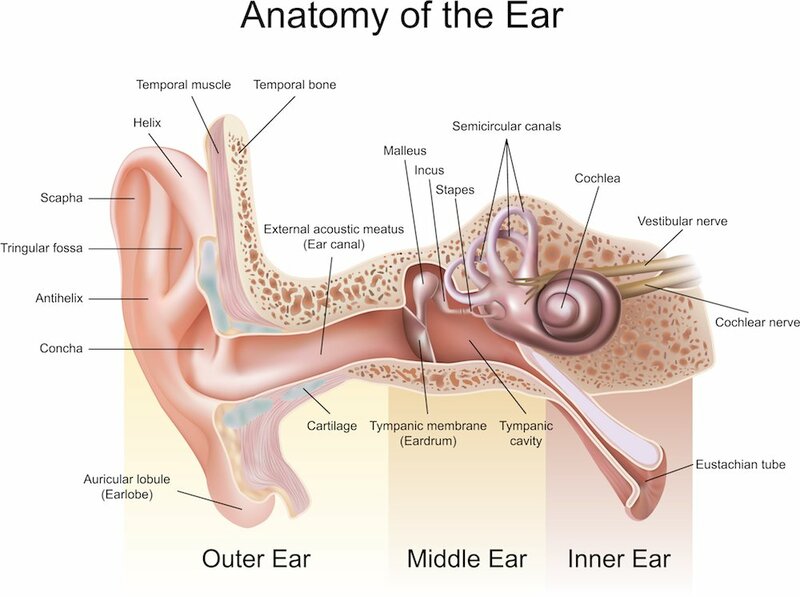 In the normal ear, sound vibrations are funneled by the outer ear into the ear canal where they hit the ear drum. These vibrations cause movement of the ear drum that transfers to the three small bones of the middle ear, the malleus (hammer), incus (anvil), and stapes (stirrup). When the stapes bone moves, it sets the inner ear fluids in motion, which, in turn, start the process to stimulate the auditory (hearing) nerve. The hearing nerve then carries sound energy to the brain, resulting in hearing of sound. When any part of this process is compromised, hearing is impaired. Diagnosis of hearing loss into one of the above categories is achieved by otological examination including comprehensive audiometric testing that is performed with masking where needed. Conductive Hearing Loss is a mechanical interference of sound conduction from the environment to the inner ear. It is therefore caused by problems with the external ear canal, the ear drum, the ossicles (3 ear bones), or the middle ear space and/or Eustachian tube. Causes of CHL can range from as simple as ear wax (cerumen) or foreign body (bead, etc.) obstructing the ear canal or fluid in the middle ear space (otitis media), to more complex problems such as holes in the ear drum (tympanic membrane perforation), absence of the ear canal (atresia), discontinuity of the ossicles, otosclerosis (hardening of the stapes bone so that it doesn’t move), and cholesteatoma (exuberant skin growth in the middle ear and mastoid bone where it doesn’t belong). Treatment of Hearing Loss is often medical or surgical. Obstructing cerumen or foreign body is cleared from the ear canal under the office microscope. In young children, general anesthesia may be required to remove a foreign body from the ear canal if the child is not cooperative. Fluid in the middle ear space (otitis media with effusion) is the primary reason for non-well-child visits to the pediatrician in the U.S. The fluid will either drain on its own or respond to antibiotic therapy in the vast majority of cases. However, ear tube surgery remains the most commonly performed operation in children. Fluid can occur in adults as well. If the fluid persists despite adequate antibiotic therapy, a small hole can be made in the ear drum (myringotomy) and, if needed, a tube can be placed. The more complex causes of CHL can be treated surgically with very good to excellent outcomes. These are discussed in more detail on other pages in this website. CHL that persists despite aggressive medical and surgical care is usually amenable to hearing aid use. Severe CHL, such as in an inoperable atresia ear, can benefit from baha™ implantation. Sensorineural Hearing Loss is nerve-related hearing loss and reflects dysfunction of the cochlea (inner ear), hearing (cochlear) nerve, or auditory brainstem. In these cases, the ear canal, ear drum and middle ear are working, but the sound is not transmitted or received properly from the cochlea inwards. Many conditions can result in SNHL, and include: presbycusis (normal hearing loss of age), noise-induced hearing loss (NIHL), Ménière’s disease (endolymphatic hydrops), idiopathic sudden sensorineural hearing loss, autoimmune inner ear disease (AIED), etc. SNHL can also occur as a result of exuberant middle ear disease, specifically untreated cholesteatoma or aggressive otitis media. Treatment of SNHL is medical in disorders of fluctuating hearing loss, use of hearing aids in the majority of cases, and surgical implantation of cochlear implant or baha™ implant where indicated. Certainly, where the cause is a surgical one such as cholesteatoma, surgery is indicated to eradicate the underlying disease, but surgery will not correct the SNHL. Mixed Hearing Loss is a combination of mechanical and nerve hearing loss. Treatment is targeted to the cause of the problem. If you have any questions about the treatment and expectations of hearing loss please call Dr. Kohan’s office for an appointment at (212) 472-1300.